Chronic ear infection is fluid, swelling, or an infection behind the eardrum that does not go away or keeps coming back. It causes long-term or permanent damage to the ear. It most often involves a hole in the eardrum that does not heal. 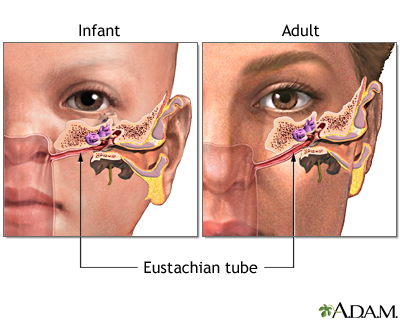 The eustachian tube runs from the middle of each ear to the back of the throat. This tube drains fluid made in the middle ear. If the eustachian tube becomes blocked, fluid can build up. When this happens, infection can occur. A chronic ear infection develops when fluid or an infection behind the eardrum does not go away. "Suppurative chronic otitis" is a phrase health care providers use to describe an eardrum that keeps rupturing, draining, or swelling in the middle ear or mastoid area and does not go away. 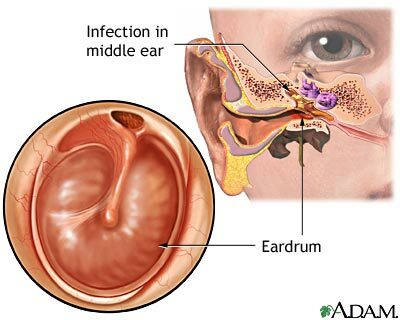 Symptoms of a chronic ear infection may be less severe than symptoms of an acute infection. The problem may go unnoticed and untreated for a long time. Symptoms may continue or come and go. They may occur in one or both ears. Cultures of the fluid may show bacteria, and these bacteria may be harder to treat than the bacteria commonly involved in an acute ear infection. A CT scan of the head or mastoids may show that the infection has spread beyond the middle ear. Hearing tests may be needed. The provider may prescribe antibiotics if the infection is caused by bacteria. These medicines may need to be taken for a long time. They can be given by mouth or into a vein (intravenously). If there is a hole in the eardrum, antibiotic ear drops are used. The provider may recommend using a mild acidic solution (such as vinegar and water) for a hard-to-treat infected ear that has a hole (perforation). A surgeon may need to clean out (debride) tissue that has gathered inside the ear. Chronic ear infections most often respond to treatment. However, your child may need to keep taking medicines for several months. Chronic ear infections are not life threatening. However, they can be uncomfortable and may result in hearing loss and other serious complications. Hearing loss from damage to the middle ear may slow language and speech development. This is more likely if both ears are affected. Permanent hearing loss is rare, but the risk increases with the number and length of infections. Getting prompt treatment for an acute ear infection may reduce the risk of developing a chronic ear infection. Have a follow-up exam with your provider after an ear infection has been treated to make sure that it is completely cured. Chole RA. 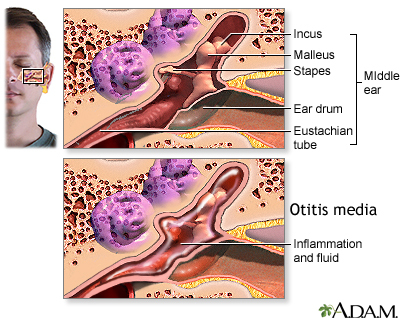 Chronic otitis media, mastoiditis, and petrositis. In: Flint PW, Haughey BH, Lund V, et al, eds. Cummings Otolaryngology: Head & Neck Surgery. 6th ed. Philadelphia, PA: Elsevier Saunders; 2015:chap 139. Marcdante KJ, Kliegman RM. Otitis media. In: Marcdante KJ, Kliegman RM, eds. Nelson Essentials of Pediatrics. 8th ed. Philadelphia, PA: Elsevier Saunders; 2019:chap 105. Rosenfeld RM, Schwartz SR, Pynnonen MA, et al. Clinical practice guideline: Tympanostomy tubes in children. Otolaryngol Head Neck Surg. 2013;149(1 Suppl):S1-S35. PMID: 23818543 www.ncbi.nlm.nih.gov/pubmed/23818543. Steele DW, Adam GP, Di M, Halladay CH, Balk EM, Trikalinos TA. Effectiveness of Tympanostomy tubes for otitis media: a meta-analysis. Pediatrics. 2017;139(6). pii: e20170125. PMID: 28562283 www.ncbi.nlm.nih.gov/pubmed/28562283. Venekamp RP, Burton MJ, van Dongen TM, van der Heijden GJ, van Zon A, Schilder AG. Antibiotics for otitis media with effusion in children. Cochrane Database Syst Rev. 2016;12;(6):CD009163. PMID: 27290722 www.ncbi.nlm.nih.gov/pubmed/27290722.